Disclosure: This is a sponsored conversation written by me on behalf of NESTLÉ® TOLL HOUSE®. The opinions and text are all mine. Banana Bread is a popular treat not only during the holiday season but all year round. 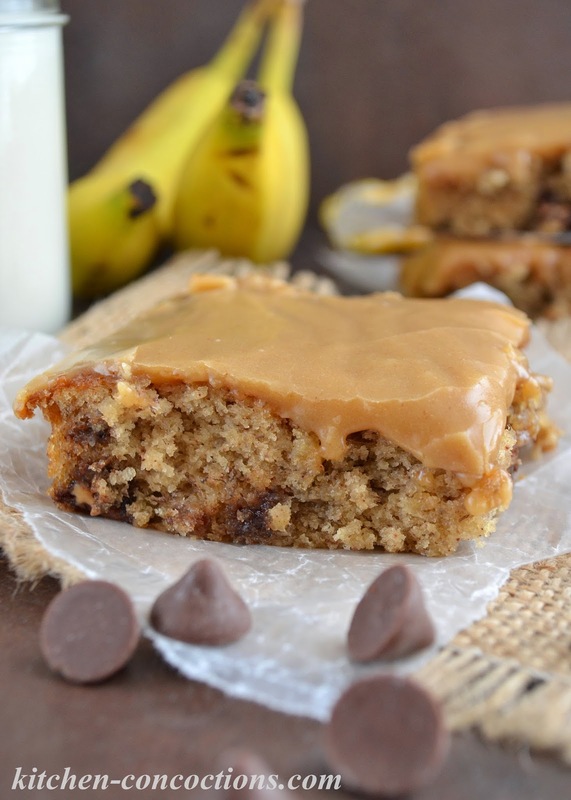 I took that traditional Banana Bread flavor but added a new and exciting twist, to create the ultimate Peanut Butter Lovers Banana Bread Bars! My Mom has always joked that she doesn’t know where my cooking abilities came from. That they must have been born out of necessity. Since my Mom does not like to cook, we often had the same things each week: Lemon Peppered Chicken, Slow Cooker Pot Roast, Spaghetti, Mac and Cheese and leftovers. Despite my Mom lacking creativity in the kitchen when dinner time rolled around, she loved to bake and was actually known for her baked goods. For Thanksgiving, it was pie palooza, with everything from pumpkin to Texas pecan to my favorite blueberry! Thanksgiving just wasn’t complete, for anyone, without my Mom’s pies. At Christmas (and pretty much EVERY holiday) we made a ridiculous amount of homemade sugar cookies and big buckets, er bowls, full of colorful buttercream frosting, and spent hours and hours cutting, spreading and sprinkling. In fact, everything I know about baking I learned from my dear Mom (today, when I tell her this, she can’t believe it… that she actually taught me something in the kitchen, but the truth is, she did!)! From properly measuring flour (the scoop and level method is the only way), to only using pure butter and vanilla extract, and if a recipe calls for nuts, chocolate chips, etc. go big and add even more! I loved to bake with my Mom as a small child and even today baking is extremely therapeutic for me and brings back such great childhood memories. Another delicious baked good my Mom was known for, was her Banana Bread. Every year as December rolled around she would bake loaves and loaves of Banana Bread to gift (with a jar of her homemade jam) to our school teachers, friends and neighbors. Her Banana Bread has become legendary, with former school teachers occasionally running into my sister (who still lives back in our home town) and asking her, not how she is doing; but how my Mom is doing and if my Mom is still making her famous Banana Bread. Even though my Mom’s Banana Bread is dreamy and has a cult following, I decided I wanted to change things up this year and take those classic Banana Bread flavors and transform them into a new recipe (I know you are probably thinking, why would I mess with a good thing, but trust me!). 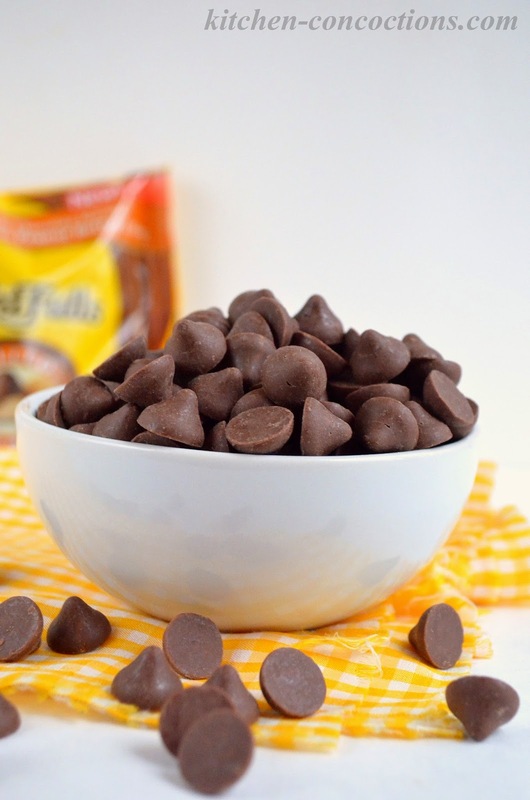 Peanut butter and banana is one of my favorite snacks, so when I discovered the new NESTLÉ® TOLL HOUSE® DelightFulls™ Peanut Butter Filled Morsels, I knew instantly want I wanted to make! These unique DelightFulls Filled Baking Morsels come in a variety of flavor combinations and are the perfect size to add to any baked good and will add a special twist to classic holiday favorites! 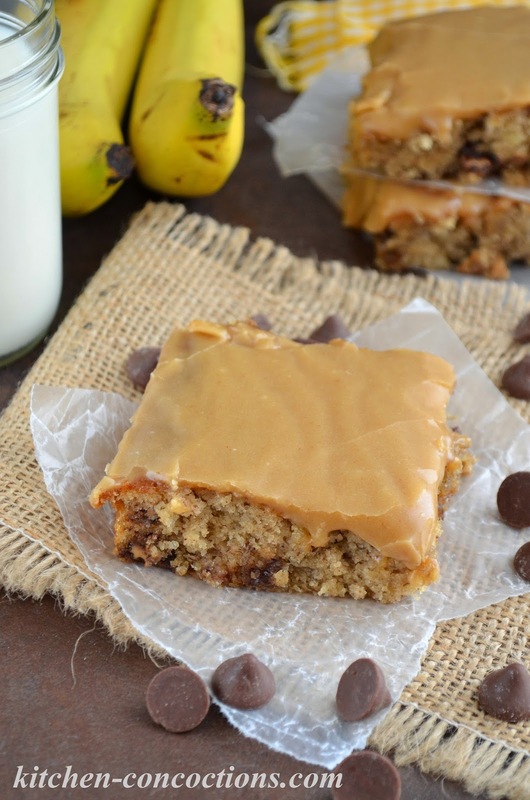 These Peanut Butter Banana Bread Bars are perfect for all my fellow banana/peanut butter lovers. 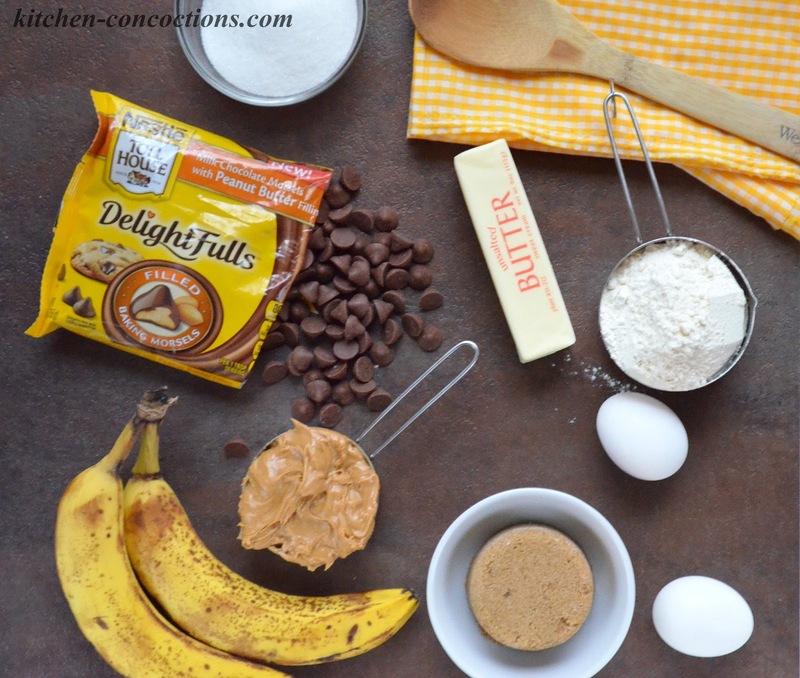 It is like Banana Bread, moist and flavorful, only in bar form and loaded with peanut butter goodness! These bars make a great after school treat or can be wrapped up to gift to others this holiday season! What is your favorite flavor combination for sweet treats? 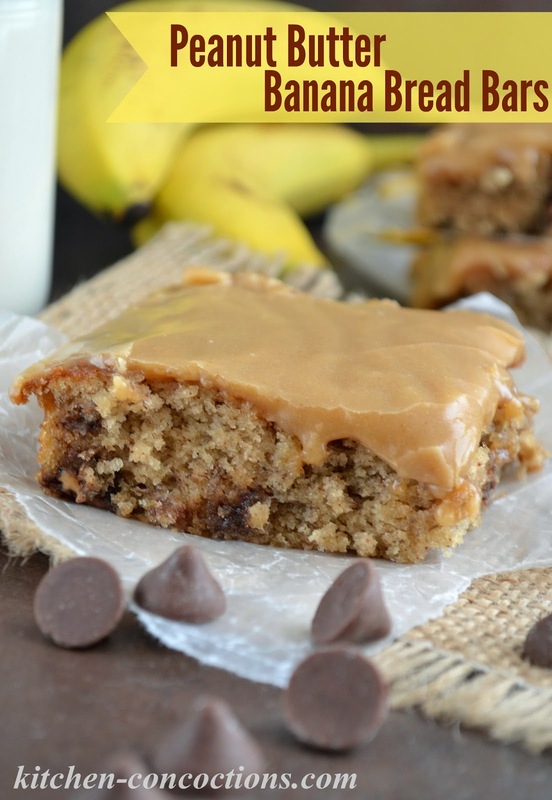 Peanut butter lovers will love this modern twist on classic banana bread! Preheat oven to 375 degrees F. Using 1 tablespoon flour and 1 tablespoon butter, grease and flour a 15 by 10 inch jelly roll pan. In a medium sized bowl, stir together flour, cinnamon, baking soda, baking powder and salt. Set aside. Using an electric mixer or stand mixer, cream together the softened butter and both sugars until light and fluffy. Scrape down the sides of the bowl and beat in the eggs, one at a time, mixing well after each addition. Beat in the sour cream, mashed bananas and vanilla extract; mix well. Slowly mix in the dry ingredients into the butter mixture, a little at a time. Continue mixing until all the flour has been added. In a small bowl, toss together peanut butter filled morsels with remaining 1 tablespoon flour. Fold peanut butter filled morsels in prepared batter. Spread batter evenly into prepared pan. Bake in preheated 375 degree F. oven for 20 to 25 minutes or until golden brown and a toothpick inserted into the center comes out clean. Meanwhile to prepare frosting, melt butter in large saucepan over medium heat. Once butter is completely melted stir in peanut butter, stirring until melted and smooth. Remove peanut butter mixture from heat and stir in powder sugar, vanilla, and milk. Whisk together until smooth and creamy and the consistency of a very thick glaze. Add additional milk or powdered sugar, if need, to reach desired consistency. Allow bars to cool slightly then, using a spatula, spread the frosting evenly over the warm bars.